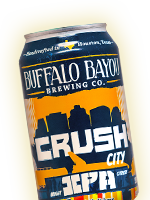 Buffalo Bayou Brewing Co. was founded in 2011 by Rassul Zarinfar and Ryan Robertson as an effort to bring Houston the type of beer they both love to drink. What began with a home-brewer's vision, sprouted to producing & self-distributing only draught in 2012 and all the way to 8,000 barrels produced in kegs, cans and bombers, state wide distribution and 74 total beers in 2018. That being said, we aren't anything without all the love and support from all of you over these past 7 years. If you have to ask what 1836 stands for, put down this beer and leave our country.